ST. GEORGE — The Labor Day weekend got a little less happy for a group of tourists from Chicago as they were involved in a two car wreck Monday afternoon. Just after 4:30 p.m. first responders were called to the intersection of Riverside Drive and River Road in St. George. There they found a 2010 Volkswagen and a 2016 Ford Flex had tangled in the middle of the intersection and neither could be moved. The 60-year-old driver of the Ford Flex had two passengers, St. George Police Officer Lona Trombley said. They were tourists from Chicago, having driven up from Las Vegas for the day. The 21-year-old driver of the Volkswagen from Linden was alone in the car. Trombley said the driver of the Ford Flex was southbound on River Road, waiting to make a left turn to Riverside Drive. He failed to see the Volkswagen coming north and turned in front of it, causing the collision. Trombley said the driver of the Flex was cited for failure to yield on a left hand turn. Trombley said all occupants were wearing seat belts and no injuries were reported. Both vehicles had to be towed from the scene. 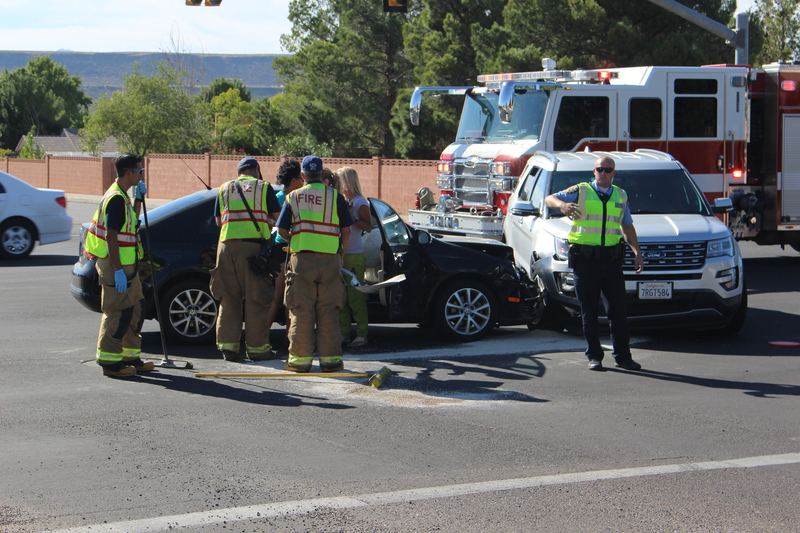 Units from the St. George Police Department, the St. George Fire Department and Gold Cross Ambulance responded to the collision. Well innocent accidents happen and that’s what this was. I’m sorry the tourist had a bad experience in our community but the most important thing is nobody was hurt. we can always rebuild or replace a vehicle. Pathetic trolls both of you. Find something worthwhile to do besides trolling. That is my job Dumbob so what’s your point !